A polygon is a closed plane figure formed by three or more line segments, called the sides of the polygon. Each side intersects exactly two other sides at their endpoints. The points of intersection of the sides are vertices. The term “polygon” will be used to mean a convex polygon, that is, a polygon in which each interior angle has a measure of less than . A polygon with three sides is a triangle; with four sides, a quadrilateral; with five sides, a pentagon; and with six sides, a hexagon. The sum of the interior angle measures of a triangle is . In general, the sum of the interior angle measures of a polygon with n sides is equal to . For example, this sum for a pentagon is . Note that a pentagon can be partitioned into three triangles and therefore the sum of the angle measures can be found by adding the sum of the angle measures of three triangles. 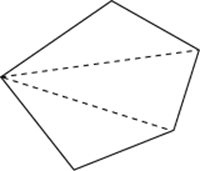 The perimeter of a polygon is the sum of the lengths of its sides. The commonly used phrase “area of a triangle” (or any other plane figure) is used to mean the area of the region enclosed by that figure.